Fox News host Sean Hannity scored President Donald Trump's first sit-down television interview following his historic summit with North Korean dictator Kim Jong Un. Hannity, a personal friend and confidant to Trump, has been in Singapore to cover the summit and sat down for an interview with Trump before he left to return to the United States. Hannity and White House press secretary Sarah Huckabee Sanders did not respond to requests for comment, but a Fox News spokesman confirmed last night that Hannity would conduct the interview and that it will be aired in full Tuesday night in the U.S., during his nightly show, according to Axios. Fox has since released snippets of Hannity's conversation with the president. "I just think that we are now we are going to start the process of denuclearization of North Korea, and I believe that he’s going back and will start it virtually immediately – and he’s already indicated that and you look at what he’s done," Trump said. 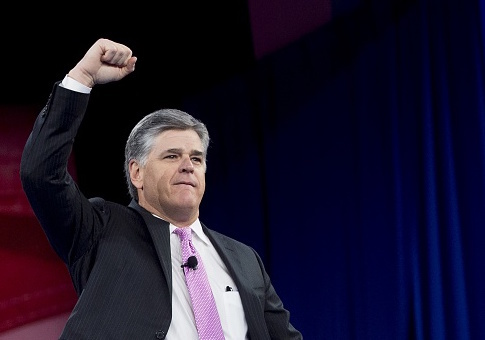 Hannity's close relationship with Trump has been well documented for years, as the Fox News anchor publicly supported him during the 2016 presidential election. A New York Magazine profile piece last month said Hannity and Trump often speak on the phone during the week about various news developments and political strategy. One of Hannity's friends told the New York Times late last year that Hannity serves as a sounding board for the president. One of the major issues they often discuss is special counsel Robert Mueller's Russia investigation and the frustration Trump experiences on a daily basis with the nonstop news coverage, according to the Washington Post. "They discuss ideas for Hannity’s show, Trump’s frustration with the ongoing special counsel probe and even, at times, what the president should tweet, according to people familiar with the conversations. When he’s off the phone, Trump is known to cite Hannity when he talks with White House advisers." "The two men review news stories and aspects of Hannity’s show, and occasionally debate specifics about whatever the president is considering typing out on Twitter," the report continues. "There have also been times when Trump has assessed the merits of various White House aides with Hannity." Hannity's interview with Trump will air in full on Tuesday during his 9 p.m. EST show. This entry was posted in Politics and tagged Kim Jong Un, North Korea, President Trump, Sean Hannity. Bookmark the permalink.